Yet I say to you teaching your students, above all with the edged weapons that are targa and rotella, large buckler, sword alone, sword and cape, sword and dagger, two swords and many other kinds of weapons you know, always teach them the stepping from guard to guard, to the front as behind and sideways and in every way possible. And teach them to accompany the hand with the foot and the foot with the hand. Otherwise you won’t do well for if you forget the order of the said stepping I will design you, as you can clearly see, but remember well that teaching the stepping above this segno, you teach in a place where there are no people you do not like, especially students of other schools and I do this so that they will not take over your foundation and teaching. > Cap. 5. Della amonitione del passegiare. > Anchora te dico che insegnando ai tuoi scholari, maxime de Armi da filo, cioè targa e rotella, et brochiere largo, et spada sola, et spada e cappa, spada e pugnale, & de due spade, & di molte altre sorte de armi che tu sai, fa’ che sempre gl’insegni il passegiare de guardia in guardia, così inanze come indietro et dal lato, et per traverso, et in ogni maniera che sia possibile, et insignargli de accompagnare la mano con il piede, & il piede con la mano, altramente tu non farissi cosa bona; sicchè pertanto se tu te adesmenticasse l’ordine del detto passeggiare, io t’el dissegnarò in questo, come tu potrai vedere chiaramente, ma t’aricordo bene che insegnando il passeggiare sopra tal segno, tu l’insegnerai in loco dove non sia gente che a te non piacesse, massime se li fusse scholari d’altre schole; & questo facio perchè el non te sia usurpato il tuo fondamento etiamdio il tuo insegnare. Reading this quote from Achille Marozzo’s *Opera Nova* notice how Marozzo writes not to a *student* of fencing, but to the *teacher*. This aspect makes his work most interesting. While not necessarily unique in this regard, Marozzo is one of the few texts explicitly written for the teacher. Of stepping This is a segno where you have your students walk from pass to pass, so to the front as behind, with weapons in hand, around and around, placing the feet over these lines that traverse the round signs. > Cap. 144. Del passeggiare. > Questo è il segno dove tu farai passeggiare li detti tuoi scholari di passo in passo, così innanzi come indrieto, con le armi in mano, attorno attorno, mettendo li piedi in su questi fili, che attraversano li segni tondi.
! (http://i2.wp.com/res.cloudinary.com/marozzo/image/upload/h_300,w_255/v1468449939/passeggiata2_lrd0vq.jpg?resize=254%2C300 "passeggiata2") And here he describes how you should teach the *passeggiare*, walking or stepping, to your student. The text is placed right alongside an illustration with the mentioned *segno* painted on the floor, two swordsmen standing on the lines of the segno’s star-shape exactly as described in text. The illustration goes hand-in-hand with another segno describing the strikes of the sword, which Marozzo reminds need to be daily practiced. It wouldn’t be a bad idea to follow Marozzo’s instructions: to have a floor decorated with the segno and to have the cutting diagram placed on the wall. And to have a student practice with these devices. The below image is from Joachim Meyer, but gives an idea of how this practice could look like. Unfortunately Marozzo does not give any further instructions on the use of his segno, so we are left guessing and improvising how to put it into practice. Here I have collected what little we know for certain, and how we can extrapolate on that information and perhaps use it to our advantage in learning Bolognese swordplay. I do not think the illustration of the segno is accurate in the way of later diagrams of the Spanish rapier tradition. We could lay down lines on top of the circles and make them fit in all sorts of mysterious ways, but none of this is hinted by the author. Perhaps we are better suited just accepting what little we have and not make up too much of our own. The original woodcut, the later copperplate and the similar engraving in Joachim Meyer’s work shown below are the pictorial references we can use, though the connection between Meyer and the Bolognese tradition is debatable. In these three the measurements and relationship of the two circles are not consistent, though they follow roughly the same pattern: the diameter of the inner circle is slightly less than a third of the outer circle and the diameter of the outer circle can be estimated to be three ordinary passes long, or the height of a man and his extended arm (as in the Spanish school of rapier), though it seems to be just a bit longer in the illustrations. An area is left between the larger and the smaller circle. Across this area eight lines (or triangles) are drawn, along which the swordsmen place their feet while stepping. I do not know whether the circles bear any additional meaning, but it is tempting to speculate. Outside the outer circle the combatants would be out of reach to strike each other and as they step inside the outer circle they enter operate in gioco largo and from there, if they will not recover again but approach further towards each other and the inner circle, they operate in gioco stretto. Relating the circles to the two fundamental types of play is at least an intriguing idea! Passing forwards and back over the segno is easy to imagine, but it would also be tempting to fit the passo traverso and passo triangulo described in the Anonimo Bolognese on the segno. Passo traverso would be on the diagonal line and triangulo perhaps directly to the side, but this is mere speculation and we don’t know whether the author of the Anonimo intended it this way. Besides direction of steps, the lines on the segno might relate to how you can angle yourself in various ways with the opponent. Often a passing step is followed by the back foot brought around behind it. This action would place you on another point of the star, aligned toward the center. The eight directions in the segno correspond fairly closely with the angles of the cuts (squalembri, tondi and ridoppii on both sides and fendenti and montanti) described in the cutting diagram. Perhaps coincidence, but makes the actions easy to remember. Curiously in the segno of Joachim Meyer the fencer is shown doing a crosswise step with the back foot. Such a step is described by Joachim Meyer as a triangle step, and a closely similar action can be found in Marozzo’s secondo assalto di spada a due mani. Certainly Marozzo told us to practice steps in every possible way, so perhaps this sort of step was to be exercised as well? The advice to move around and around is intriguing as it reminds us of the movement in the later Spanish style of la verdadera destreza. 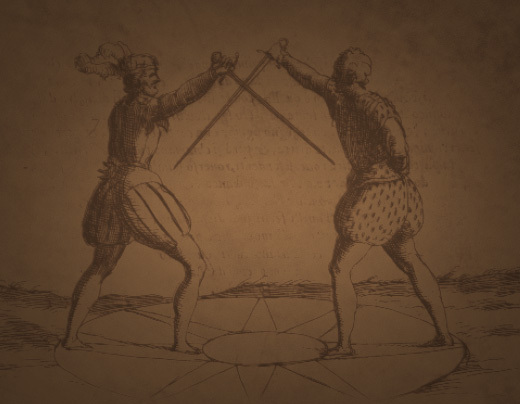 It renders a picture of the fencers moving around inside the circle, not engaged in combat but practicing their positions and countering the opponent’s guard with a posture of their own. Having examined the said student from guard to guard, and consider him being in the said Guardia di Becha possa, encourage your student that he ha sto go to this guard when his opponent goes to Porta di ferro larga, stretta or alta, following him from pass to pass and guard to guard: that is, if [the opponent] goes in Coda longa e distesa, you have him go in Becha cesa. If [the opponent] goes in Coda longa e larga you have him go in Coda longa e stretta. If [the opponent] goes in Becha cesa, you have him go in Cingiara porta di ferro alta. If [the opponent] goes in Guardia d’intrare, you have him go in Guadia alta. Holding this order he will go in the end with the right foot in front and the point of the sword turned towards the enemy’s face and the wrist of the hand turned downwards and the arm well extended and tell him that he has arrived in Guardia di faccia. > Avendo esaminato el ditto scholare de guardia in guardia, e considerato che sia in ditta Guardia di Becha possa, conforterai il tuo scolaro che lui debbia andare in questa guardia quando el suo nimico andasse a Porta di ferro larga o stretta o alta, seguendolo di passo in passo, el sopraditto, & di guardia in guardia: cioè se lui andasse in Coda longa e distesa, tu il farai andare in Becha cesa, & se lui andasse in Coda longa e larga, tu el farai andare in Coda longa e stretta, & se lui andasse in Becha cesa, tu il farai andare in Cinghiara porta di ferro alta, & se lui andasse in Guardia d’intrare, tu ‘l farai andare in Guardia alta; tenendo quest’ordine lo farai andare alfine con la gamba dritta inante & con la ponta de la spada rivolta verso la faccia del nemico & il polso de la mano volto a l’insuso & il braccio ben disteso & li dirai che lui è andato in Guardia di faccia. Again it is hard to say whether this is supposed to be done on the *segno*, but practicing it this way would certainly not be against Marozzo’s advice! Finally we can consider the advice to teach in privacy. This is something Marozzo talks about earlier on as well, in the first chapter. There he gives a different reason: so that the student does not need to worry about making mistakes and being ashamed in front of those watching. Not to show your teaching to students other schools is also understandable since there must’ve been a lot of competition between schools. This might also suggest that the way of stepping truly is the foundation of the art and what makes Marozzo’s teaching unique. Luckily we do not have to work in secrecy any longer. Rather, we wish to share our discoveries, and the competition is perhaps in getting credit for the best ideas and finds!